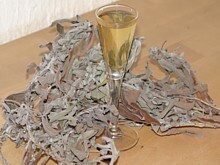 Hang the sage to dry for a week and then put it into a bottle with the alcohol. Leave this bottle for 2 weeks in a dark place, shake on a daily base. After two weeks, strain the fluid. Dissolve the sugar in 2 cups of boiling water. Allow this to cool down and mix it with the alcohol. If the alcohol is not clear enough, you can filter it by using a coffee filter and 4 crumbled tablets of Norit. Keep filtering and changing the coffee filters until the fluid is completely clear. If you do not have access to strong alcohol, you can use vodka. In that case, try to dissolve the sugar in just a little water, unless you like sage lemonade. 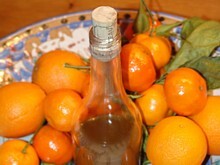 Scrub the tangerines clean and peel them; cut the peel in strips and put this in a bottle with the alcohol. Leave this bottle for 2 weeks in a dark place, shake on a daily base. After two weeks, strain the fluid. Dissolve the sugar in 2 cups of boiling water. Allow this to cool down and mix it with the alcohol. If the alcohol is not clear enough, you can filter it by using a coffee filter and 4 crumbled tablets of Norit. Keep filtering and changing the coffee filters until the fluid is completely clear. If you do not have access to strong alcohol, you can use vodka. 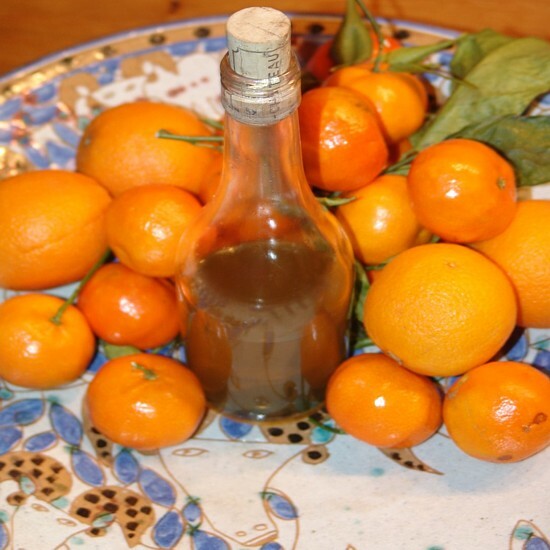 In that case, try to dissolve the sugar in just a little water, otherwise you end up with tangerine lemonade.